This week I complete the 33 signs we own too many things. Check out the first 22 signs in these posts. We have things that don’t serve a purpose. I have half a garage and most of a basement packed with stuff that serves no purpose. If our things serve no purpose, not even the creation of joy, we own too many things. We have multiple junk drawers, junk cabinets, junk closets, or a junk room. See the garage and basement above. If we have junk, we own too many things. We have debt. Debt means we bought more than we could pay for. This is tough because few people can pay for a house with cash, but still true. 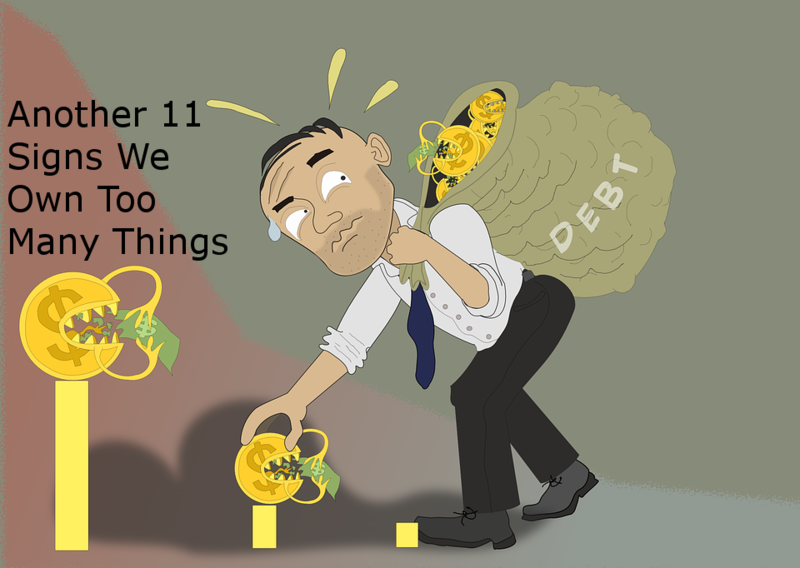 If we have debt, we own too many things. We buy things to store more things. We have filing cabinets, plastic tubs, and metal shelves to store our stuff. If we buy things so that we can store more things, we own too many things. We don’t have flat empty surfaces. Flat surfaces are a magnet for clutter. If we have flat surfaces that aren’t empty, we own too many things. We have furniture no one ever uses. We have furniture that the dogs sit on more than we do. If we have furniture that doesn’t get used, we own too many things. We have a cabinet or closet that we are careful to open because something might fall out. Careful when opening the board game, sheets, towels, random stuff closet. Something is likely to fall out. If we have a cabinet or closet that stuff falls out of, we own too many things. We have stacks of something. Stacks of CDs, DVDs, books, bills, and clothes. If we have stacks, we own too many things. We have one or more rooms with a path. See the garage and basement from number one. If we have rooms with a trail, we own too many things. We are making payments on something we use less than a few times per year. We haven’t used the RV in two years. If we make payments on something we rarely use, we own too many things. Our kids can go for more than one week without doing laundry. And we have four kids. If our kids can go for more than a week without doing laundry, we own too many things. I now have a list of 33 ways that I can simplify. Here is a challenge: Every week pick one of these 33 signs and try to simplify your life. Some are so overwhelming that they will take many weeks to simplify. Which one will you tackle next? Avelar, Rilson, S. “Debt-Loan-Credit-Money-Finance.” Pixabay, n.d. https://pixabay.com/en/debt-loan-credit-money-finance-1500774/. becker, joshua. “Don’t Just Declutter, De-Own.” Becoming Minimalist, February 25, 2017. http://www.becomingminimalist.com/dont-just-declutter-de-own/.